The D4R7 project involves construction of a radial expressway (R7) and a bypass motorway (D4) surrounding the eastern side of the city. The project includes an almost-3km-long bridge formed by four structures: two approach viaducts and balanced cantilever bridges over the Kayak Channel and the River Danube. 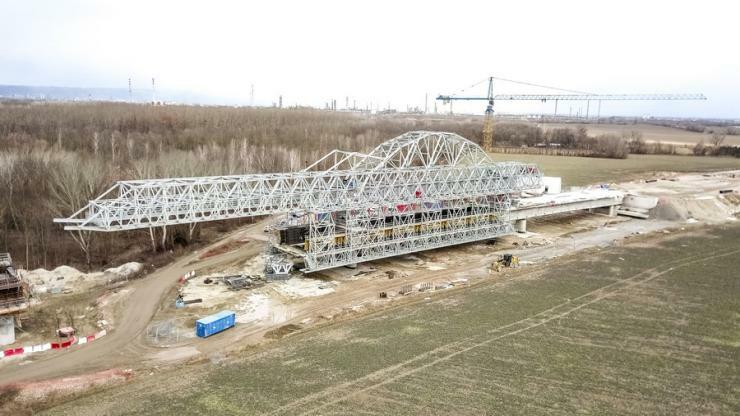 D4R7 Construction Joint Venture – which is made up of Ferrovial and Porr – used a moveable scaffolding system for the operation to pour the box girder of the first span of the east approach. Assembly is almost complete of another MSS that will be used for the west approach. FHECOR Ingenieros Consultores has been working since 2016 as design checker of the main structures of the D4 - where the Danube Crossing is located - and the R7, the radial motorway from Prievoz Interchange to Holice. Work on the main bridges over the River Danube and the Kayak Channel is currently focusing on the substructures.